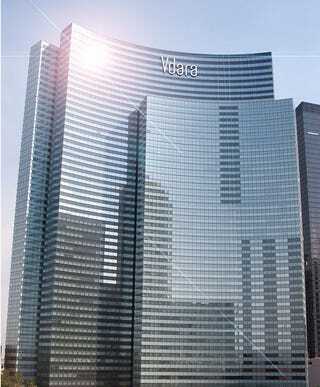 The curved glass facade of the Vdara Hotel in Las Vegas promises a world of climate-controlled luxury. Except if you are poolside, where sunlight reflected and intensified by the building's shape has been melting plastic and burning people's hair. The surface of the building acts like a parabolic reflector, concentrating solar heat into a specific target area. It's the future of urban thermal warfare, perhaps: hotels armed against other hotels in a robust defense posture defined by pure heat. Apparently the building's designers knew this could be a problem, and coated the windows on the south side of the hotel with a film intended to scatter the light more evenly. It didn't work. Hotel workers call it the "death ray," but a public affairs rep at the hotel said it should be referred to as a "solar convergence phenomenon." Apparently the plan is to fix the problem by providing more shaded areas poolside - perhaps some trees, which hopefully won't catch fire when they're exposed to the solar convergence phenomenon.